I received free product to facilitate this article. All opinions are my own. My sister and I grew up watching Winnie the Pooh and all the adventures. I have so many wonderful memories of reading the books and watching the shows! Our family is sure excited for the Christopher Robin Movie In Theaters August 3! 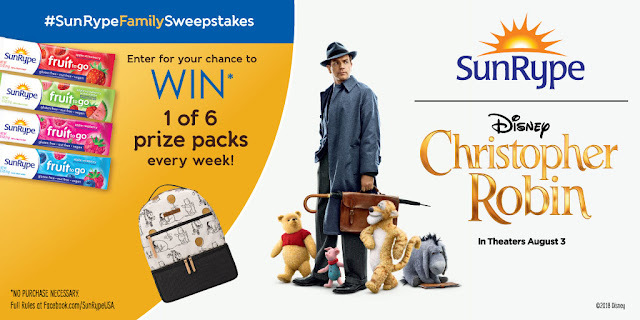 Starting on July 30 – August 24 you can enter the #SunRypeFamilySweepstakes Celebrating the Release of Disney’s Christopher Robin In Theaters – August 3, 2018 daily for a chance to win. 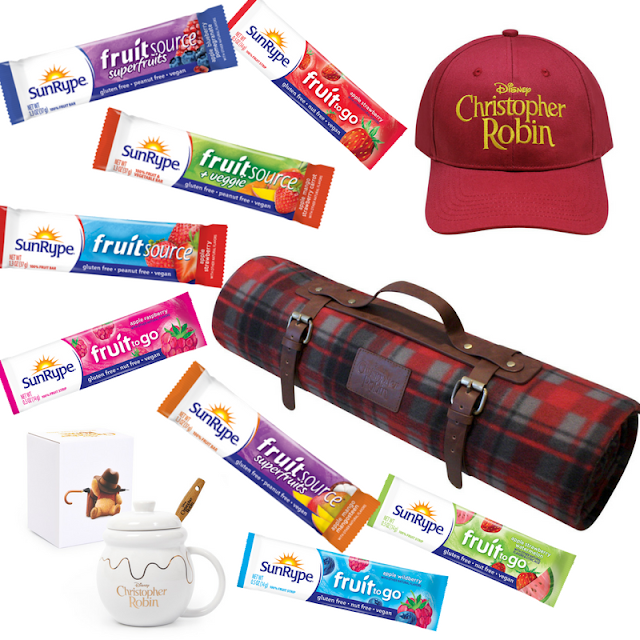 Each week there will be a randomly selected winner of various Disney’s Christopher Robin prize packages ~ Entrants will have a chance to win prizes like a Petunia Pickle Bottom Winnie the Pooh and Friends backpack, 4 Fandango movie admission codes to see Disney’s Christopher Robin, a digital code to download the film’s soundtrack, a picnic blanket, a honey pot mug, a feature film poster and of course, a variety of SunRype snacks! NO PURCHASE NECESSARY. The sweepstakes begins on July 30th at 8:00 am PT and ends on August 24, 2018, at midnight PT. Open to legal residents of the 50 U.S. or D.C. who are 18 years of age or older. The sweepstakes can be entered ONCE PER DAY. Find a full list of the prizes available to be won, approximate retail values, how to enter, odds of winning and weekly drawing dates along with the full rules and regulations at www.facebook.com/SunRypeUSA. Void where prohibited. Sponsor: Sun-Rype Products Ltd.
Our family really enjoys SunRype Fruit snacks as they give us the energy we need to stay active. Find a store near you here or purchase on Amazon and use code SNACKS10 for a 10% Off discount.